"Her interpretive nuances, luxurious sound, sure-footed articulation, delicious legato lines and perfect intonation, really moved me. Rarely have I heard such sublimely satisfying flute playing!" "Karen Kevra made a most excellent soloist. Her flute has a low, smooth, solid tone, the more impressive given Ewazen’s tendency to write high-lying solo lines...elegantly beautiful flute." "Flutist and flute enthusiasts who want to expand their repertoire and listening pleasure should get this CD, Works for Flute and Piano of Louis Moyse. 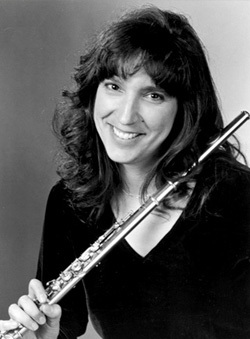 The performances of flutist Karen Kevra and pianist Paul Orgel are highly polished." "Genin's Carnival of Venice showpiece contains about every challenging flute technique: accelerated runs, elaborate trills, rapid fingerings...remarkable embouchure...and rapid double and triple tonguing. Kevra breezed through them effortlessly for which she received a standing ovation." "Karen's ideas about phrasing and texture, her flute sound and her grasp of divergent musical styles are most impressive." "She has a sure technique. A huge open sound with great intensity, a rainbow of colors, long-breathed phrasing, and clean and incisive articulation. She is a flutist who will captivate and impress you." "Kevra has a tremendous sound, tight articulation, and the ability to reproduce coloristic markings with ease and assurance." "Karen Kevra is a wonderful artist who has found her own individual voice. I have heard her as a soloist with orchestra and have performed chamber music with her. In both settings her mind is always searching and probing the depths of the music. She is an interesting musician who is destined to have a long and satisfying life in music." "Kevra's playing exhibits everything that matters in music making. Her tone is rich, warm, and unerringly appropriate; her musicianship is a rare balance of innate and well-studied musicality." "Kevra and Orgel are colleagues of Moyse...Their level of commitment gives this recital a special quality. They connect with the music on many levels. Their interpretation is as alluring as the compositions are rich." "A must for flute fanciers and anyone else with ears." "Karen Kevra is a delight to listen to, a delight to know, and a delight to work with." "She's definitely in the top ranks among flutists. She's an artist with real imagination, both in how the music goes and how it fits into performances and in putting together a concert series." ​her musicality are extraordinary. She is truly a world class flutist."